For the first time in eight years, the U.S. Army Corps of Engineers is the process of filing for routine maintenance dredging near the Snake River dams. The fact that it is close to the dams, seems to bring the dam breaching advocates out in full force touting their claims that barging on the Lower Snake could easily be replaced by rail. 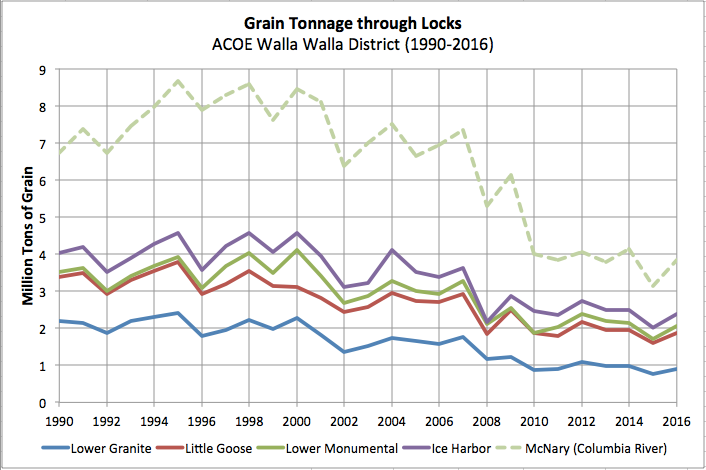 Pacific Northwest Waterways Association Executive Director Kristin Meira says that their analysis is faulty and that barging is a critical component in transportation choices, especially for Pacific Northwest wheat. Meira: "The Columbia River system is the top wheat export gateway in the country. Almost 50 percent of the wheat that leaves the deep draft lower river from all those export facilities almost 50 percent of that wheat arrives on the lower river from our inland system by barge. It is a major shipping route for our Northwest wheat farmers the folks that are growing our soft white wheat and other products." Meira says thinking that barge transportation can easily be replaced by rail and trucks is very faulty reasoning as the average four barge tow moves the same amount of cargo as 540 trucks or 140 rail cars. Meira: "Removing an entire mode of transportation which is what would happen if the Snake River dams were breached removing barging from the equation is just not smart for our region. So it is important to tell the story of what is essentially what is an unseen highway in our region." Benefits of Snake River Barging Continue to Grow <-- Listen at original site.